This month’s Genre has been chosen by Tony of Coog’s Reviews and it is Political Thrillers. Try to think out of the box! Brief Synopsis – An American actress who is an activist for oppressed people is recruited by the Israeli Mossad in order to try and capture an elusive Palestinian terrorist. My Take on it – I decided that in order to make my guest choices of the Genre for the Genre Grandeur series more personal (and expand my own personal horizons of these genres), I will take a recommendation from my guest for a film to watch for this Genre Guesstimation series. This film was Tony’s choice for me to watch. This is a film that I saw years ago and recall enjoying. I hoped that the nearly twenty years since seeing this wouldn’t change my opinion of this too much. They do a wonderful job outlining the fact that in many conflicts, the fine line between good and evil can be quite thin and in this case that is so true. 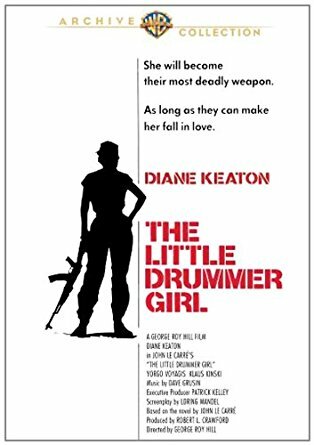 Diane Keaton is quite good in the lead role which allows her to show such a vast emotional range since her character gets developed so well because of her somewhat conflicting internal opinions along the way. The story itself is presented quite well and the story arc moves at a nice pace through the web of political intrigue that constantly pops up here. I have been told that the novel works much better than the film but regardless, they do a nice job keeping this thriller quite interesting, enjoyable and poignant throughout. Bottom Line – Great story that shows how thin the lines can be when it comes to good and evil in the war on terror. Keaton is quite good in this role because she must use a large range of emotions in order to help develop the persona of her character who herself is in constant internal conflict. The story moves in a nice arc and the maze of politically motivated actions works really well. I’ve heard that the novel is much better, but this was still an enjoyable thriller. Recommended! Genre Grandeur Worthy? – Comes close, but something is missing that would help propel it one step further. I am now dying to this film, thanks for the review. I am also pretty excited about Park Chan-wok’s forthcoming TV adaptation of the novel starring Florence Pugh and Alexander Skarsgård. I am sure it will be something!